Jonathan created a little greyboxing tool dubbed 'Slabs' for use in prototyping puzzles in The Witness and blocking out the world. it essentially works by giving you cubes in which you can drag one side at a time without moving any other part of the cube, almost like Push/Pull in Sketchup or something, and this works locally to the slab object so you will never get any weird skewing of the mesh. This was later adapted by one of the game's artists Eric A Anderson on his next game Obduction. (Cyan Worlds, 2016) Where a similar system was implemented into UE4. I was interested in a possible use for my own walking-simulator type game ideas I had at the time so I sent him an email asking about how it works and he came back with really helpful information. I also asked him how tools like this differ from using things like BSP in production, with BSP being quite dated and not allowing a lot of flexibility and control. Slabs is simple in how it works but it doesn't need much else. I shared the video and people were quite enthusiastic about what it could do despite it's simple nature. There were a suggestions for adding in support for different meshes, instanced static meshes, uniform scaling. Cool stuff that could work on this, but for some of this I would need to delve into C++, something that I haven't really done before. Also if I add custom mesh support and all these other functions it becomes less of a individual greyboxing tool and more of a new mode that allows you to scale any mesh in that way, very similar to what Epic have already implemented in the VR editor, so I would need to rethink how I would approach the system unless I have the blueprintable slabs then a C++ component which features a full toolset for all static meshes. I spent a bit of time fixing a problem with the pivot, which always needs to be at the center of the slab. Fixing this issue taken a lot longer than I thought but now that's it's fixed using slabs is a lot more intuitive. So that is one thing I have been working on, I will come back to Slabs soonish as soon as I have a clear plan of what I am doing for my masters, I will be hopefully testing out some slabs stuff soon as I need it for future projects. This is something I was working on when I couldn't get slabs to work, a simple grid based movement system. I was thinking about classic RPGs and their movement systems and wanted something like that in unreal but represented in 3d. A little experiment that I could build on at a later time. So a bunch of us taken part in the UE4 Megajam last week! Myself, Amber Jamieson, Zhane James-Marshall and Dominic Mathuse. AKA The Trash Pandas! (Amber's idea) The theme was 'Settle The Score' so we interpreted that in a owing someone money kind of way so 'Split The Bill!' was created. You can view the submission post HERE! You can download the game and see what you think. 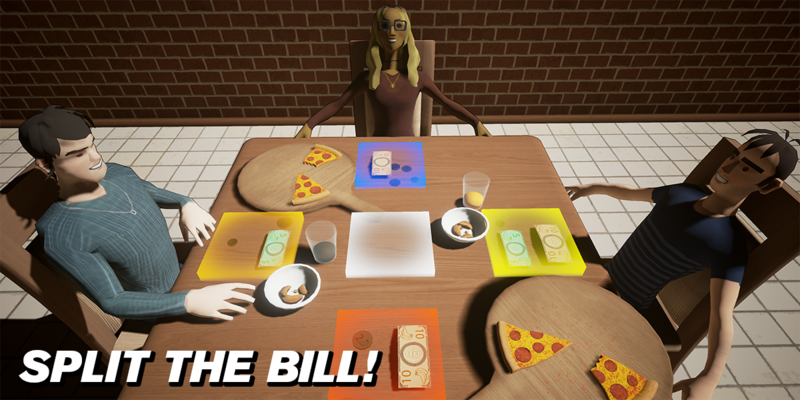 "Split The Bill is a monetary puzzle game where you have to settle the bill at the end of a meal. The goal is to make sure everybody has paid their correct share while trying not to make anybody unhappy with the contributions. You can’t please everybody! But you have to try your best. Or you can play dirty and try and pocket leftover change for yourself." The game is a bit incomplete and the third level is completely unfinished but as our first attempt at a game jam I thought we did quite well and we were quite ambitious with the actual design. The plan going forward is to take part in a load more game jams, trying to get faster and more experimental with the designs. Those are the biggest things I have done recently, there should be some more experimental pieces soon as I move onto creating a series of rapid game prototypes. 1. BLOW, J. (2014) Jonathan Blow's Home Page. [Webpage] Available from: http://number-none.com/blow/ [Accessed 20/10/2016]. 2. BLOW, J. ANDERSON, E. ANTONIO, L. BEL, S. CASTAÑO, I. SMITH, A. SPANYOL, O. (2016) [Weblog] The Witness Dev Blog. Available from: http://the-witness.net/news/ [Accessed 20/10/2016]. 3. THEKLA, INC. (2016) The Witness. [Online] Playstation 4. Thekla, Inc.
4. CYAN WORLDS INC. (2016) Obduction. [Online] PC. Cyan Worlds Inc.
5. BRODERICK, J 'Jbroderick'. (2016) Epic Megajam Submission Thread - Post #180. [Online forum post] Epic Games. Available from: https://forums.unrealengine.com/showthread.php?124973-Epic-MegaJam-Submission-Thread&p=608922&viewfull=1#post608922 [Accessed 20/10/2016]. 6. JAMES BRODERICK DESIGN (2016) UE4 Top Down Grid-Based Movement Prototype. [Online video] Available from https://www.youtube.com/watch?v=kaE__ouyHMU [Accessed 20/10/2016]. 7. JAMES BRODERICK DESIGN (2016) UE4 Slabs - Blueprint version prototype [Online video] Available from https://www.youtube.com/watch?v=gnQ7FVs15zk [Accessed 20/10/2016]. 8. JAMES BRODERICK DESIGN (2016) UE4 Slabs - Pivot centering, other mesh support and volumes [Online video] Available from https://www.youtube.com/watch?v=HFuwIoybckE [Accessed 20/10/2016].